Costa Rica is known for its world-class whitewater rafting. It has many fantastic rivers for all skill levels, on which rafting trips can last anywhere from a few hours to a four or five days. Our Water & Wave students are currently on a multiple day rafting trip on of Costa Rica's most famous rivers, the Rio General(map? or wiki). Rio General is near San Isidro, in the South West portion of the country. The Rio General is typically a Class III to Class IV river, as defined by the International Scale of River Difficulty. Although there are more than 1,000 miles of rapids in this huge river system, Costa Rica Outward Bound courses typically run the portion from San Isidro to El Brujo. (This is also the part that gets the most commercial attention). While this portion of the river is only about 40 miles long, it produces a different kind of whitewater experience from others of Costa Rica's rivers. Kayakers in particular love surfing the Rio General's huge waves and tackling the big holes and rapids not found in Costa Rica's other rivers. 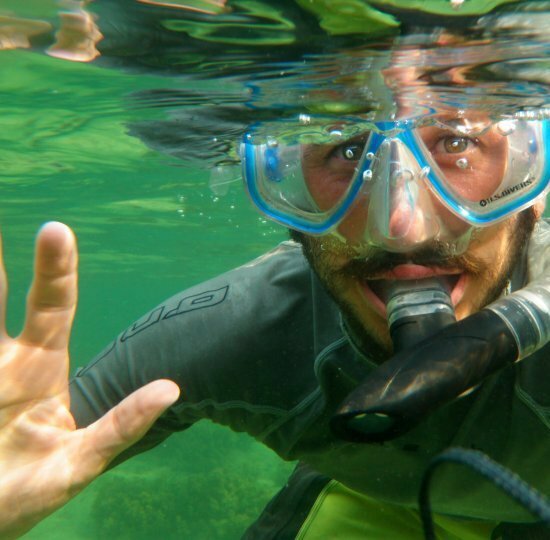 For more information on Costa Rica's other whitewater rivers, click here, and to follow the progress of our Water & Wave students, or any of our other courses, check out updates on our Facebook page. 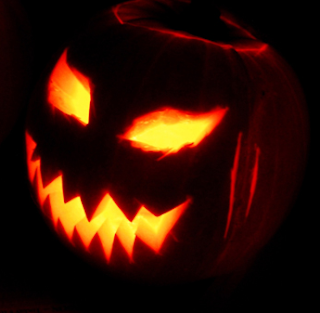 This weekend is Halloween! Time for candy and costumes, ghosts and ghouls. While Halloween isn't a traditional Costa Rican holiday, it is quickly gaining prominence, especially among the younger Ticos. Here is a great blog post from "Eye On Costa Rica" about Halloween in CR! Halloween….in Costa Rica. A Happy Holiday?... : "Well, it’s almost that time of year again, October 31st, when countries like the USA, Canada, Great Britain, Ireland, France and many other countries around the world celebrate Halloween. A mostly unfamiliar tradition in Costa Rica..."
Meet The Instructors for our Fall 2010 Leadership Course. For more information on our Field Staff and to see their certifications, click here. 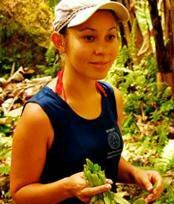 About: Even though she was born in Nicaragua, she moved to Miami, FL, at age four, then went to Montreat College in North Carolina, where she earned a Bachelor of Environmental Studies and Outdoor Education. 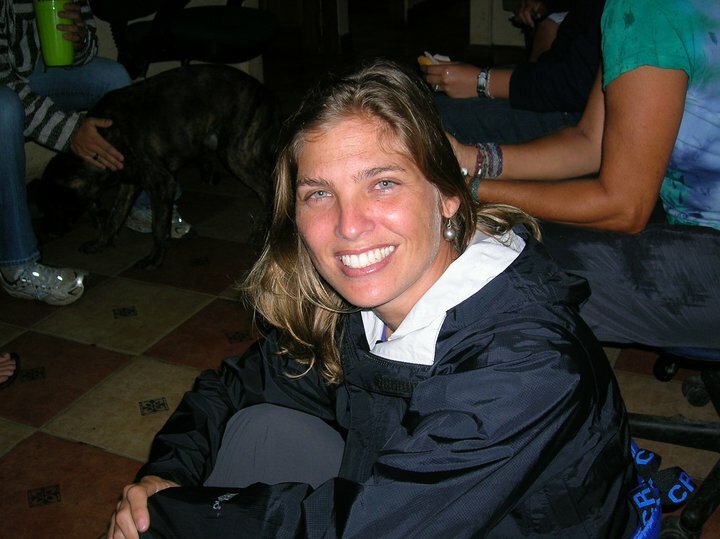 Since then, she moved to Nicaragua, Boulder, CO, and then back to Nicaragua where she currently works as a science teacher at the American Nicaraguan School. About: Before joining Costa Rica Outward Bound, Sean spent time studying in Mexico, and then teaching ESL in Pennsylvania. Although he loves traveling, Sean is very close to his family and plans to move to the states when he gets older. 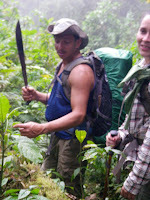 About: Orlando is arguably the strongest instructor we have at Costa Rica Outward Bound. He not only built his house for his wife and five kids, but he carried their cast iron stove 15 km to his house on mountainous rainforest terrain.Last December, he carried the large water tank 12 km to the small village during a water supply service project. About: Mauren is one of our toughest female instructors. She knows the rainforests of Costa Rica inside and out, and is always happy to share her knowledge. One of Mauren's surprising passions is for watching free-style motocross. When she's not instructing courses, Mauren enjoys playing soccer with people in her town. About: When he is not rafting or river kayaking, Joe is a one man show on his banjo. He has a passion for the environment, a seemingly tireless supply of energy and a gift for story-telling. Joe is always fun to have around and is an undisputed master of the river. Bienvenidos to the two newest additions to the Costa Rica Outward Bound Family - Zoe and Rocky! They are both American Staffordshire Terriers, like "Petey the Pup" from the movie Little Rascals. Don't be alarmed though - these two dogs are the sweetest things on four legs, and are fast becoming favorites here on base! Zoe, the grey-blue pup is a year and three months, while baby Rocky is only three months. Check them out in action! This week is Carnaval in Limón, Costa Rica. Limón, which is a port town on the central Caribbean coast, is famous for having the largest Carnaval celebration in all of Costa Rica. It's a cultural celebration that has also become a major tourist spectacle, attracting thousands of visitors from across Costa Rica and abroad. The week-long festival which began last Wednesday celebrates La Día de las Culturas, or the Day of Cultures. This makes its setting in Limón fitting, since the Caribbean coast is a melting pot of Spanish-Costa Rican, African and Caribbean Culture. Leading the festivities are the comparsas, or the traditional dance groups. The term comparsas applies to any traditional dance group in any Latino part of the world, but at the Limón Carnaval the comparsas are truly the spirit of the Caribbean city during the festival celebrations. Tico Comparsas spend the entire year leading up to Carnaval carefully combining Africa, Caribbean and Costa Rican motifs into their dances, costumes and music. They will be center stage on Saturday, when Limón Carnaval culminates with a street party un-matched anywhere in Costa Rica. Check out the video above to watch some comparsas in action! On top of being a great souvenir gift, we've found that the simple Sarong can be one of the most versatile items to pack when you've got limited space. Whether you're going to the beach, hiking in the woods or heading out to eat, a sarong comes in handy in just about any situation. Tropical paradise isn't quite paradise if you're being eaten alive by minuscule blood-suckers. When you run out of insect repellent (or if you don't have space to pack enough for the whole trip) a cover up can be invaluable in keeping pesky mosquitoes at bay. Or, for those opposed to toxic warfare, protect your skin by soaking your sarong in coconut oil, then throw it over your shoulders and stay mosquito free. Costa Rica is much closer to the equator than most people realize, and the sun shines much hotter here. Even if you're very diligent about applying and reapplying sunblock, its easy to get burned (especially when you're swimming and sweating all day). Having a light layer over your skin can help protect you from the sun and keep you from getting nicknamed "lobster-legs". Drape a sarong over exposed skin and feel immediate relief from intense rays. Quick-drying, light-weight and easily to de-sand, a sarong is the perfect substitute for a bulky beach towel. Lay it on the sand and catch some rays, or use it to dry off on your way out of the water. Hang it up on a nearby branch or lay it in direct sunlight and your sarong will be dry and ready to pack up even before you are! Yoga is a great way to stretch your muscles out and relax your body after a day of hiking, surfing or paddling. Carrying a yoga mat with you when you're backpacking however, might be a little excessive, even for the most dedicated yogis. Instead, find a flat space on the ground (or sand), lay out your sarong and OM to your heart's content. When you're finished, simply pick up and shake off your sarong, and put it back in your pack. A knot here, a tuck there, and you can go from beach to fabulous in no time flat. Sarongs can be cleverly turned into a dress, skirt or top, a fashionable neck-scarf or a head covering. They're great to wear on the way off the beach into a restaurant and transition well from day to night. As a commitment to serve is part of our mission statement at Costa Rica Outward Bound, we are always excited about partnering with new community service organizations here in Central America. Most recently, we have partnered with SIGA Ministries to deliver school supplies to children in underdeveloped regions of Costa Rica and Nicaragua. SIGA, which stands for Servants in Grace Abounding, is a "ministry of encouragement" that aims to improve the quality of life in remote regions of Latin America. Founded by Ruth Clowater and her husband Carlos Espinoza in 2004, SIGA Ministries, Inc. is a Virginia-based 501(c)3 in the United States with full-time outreach programs in both Costa Rica and Nicaragua. SIGA Ministries works in remote communities to provide educational materials for children, facilitate community development projects for indigenous peoples, teach adult literacy classes and fund womens empowerment and economic initiatives that aid women entrepreneurs in starting new businesses. 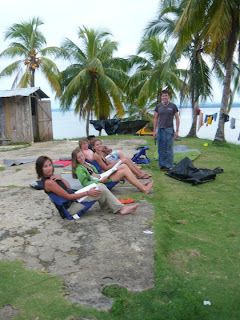 Costa Rica Outward Bound Tri-Country students will be working directly with SIGA Ministries to deliver school supplied to a remote town in Costa Rica along the Sarapiqui River. The Tri-Country group will deliver school supplies to the village of Arbolitos as they paddle up the Sarapiqui on their way to San Juan Del Norte, Nicaragua. Then SIGA will help to deliver the school supplies to over 300 students in about 24 schools in and around Arbolitos. The children will receive things like pens and pencils (especially decorative ones), glue sticks, erasers, individual pencil sharpeners and composition books (in spanish: cuadernos). There will also be small toys and/or personal items that will be given as Christmas gifts during the holiday season. To learn more about SIGA Ministries check out http://www.sigaministries.org. As part of Costa Rica Outward Bound program, we remove the distractions of the outside world. This means no MP3 players, computers or cell phones while on course. We do this in order to help students disconnect from the high-tech world they live in so they can enjoy their experience here in Costa Rica. That does not mean it is impossible to contact with students while they are in Costa Rica. Here are several easy ways to keep in touch with students while they are on course. Facebook is a great way to stay up-to-date on what students are doing while they are on course. We post regular updates on our Fan Page about the whereabouts and activities of students, as well as upload photos from course. NOTE: While we wish we could post photos more often, our social media staff does not have access to students or their cameras until they return to base. Please be patient - we put up photos as soon as we get them in the office! 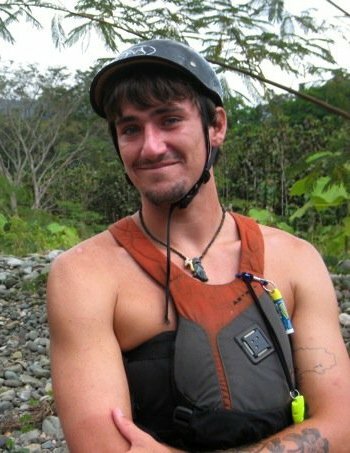 Congratulations, you have officially become a fan of Costa Rica Outward Bound! Now you can post on our wall, make comments on our posts and look at photos of students on course. NOTE: Students will not have access to the internet while they are on course, so they will not be able to see or respond to your wall posts. If you have a more personal, private or important message to send to your student while he/she is on course, please follow the instructions for how to email students on course. In case of emergency, Facebook should only be used as a last-resort method of contacting us. Please refer to our Emergency Contact Procedure for more information on how to contact students during an emergency. The best way to communicate directly with a student is to send an email to students@crrobs.org. Please include the student's name and course in the subject line. Any email received in this manner will be printed out and given to students as soon as it becomes possible. Letters may be delivered on re-supply days, or when the students return to base. Additionally, students on longer courses may have the opportunity to write emails to their friends and family on their transition days, although we cannot guarantee that will be the case for every course. When they first arrive on base after landing in Costa Rica, all students are required to contact their families to assure they arrived safely. After this point however, students will only have access to the telephone in an emergency situations. If you want to speak to one of the office staff, we are happy to answer any questions or address any concerns you may have. We are reachable between 9 a.m. and 5 p.m. MST. If you are calling outside of those hours, please leave us a message and one of our staff members will return your call as soon as we are back in the office. In the case of an emergency that occurs outside of these hours, please refer to our Emergency Contact Procedure. We do not encourage families or friends to send physical mail to students while they are here for one simple reason: It most likely won't arrive until after the student has left Costa Rica. 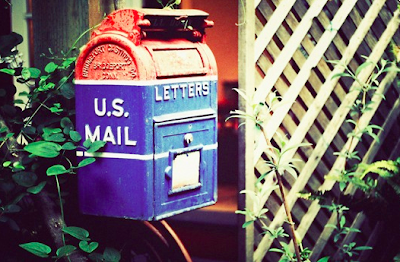 Mail to and from Costa Rica can often take an excessively long time to be delivered. For example, an Easter package that was sent to one of our staff members in April did not arrive on base until early September. That being said, If you absolutely must send mail to a student while they are here, it can be sent to the address listed below. Please note that it is a P.O. Box, so packages larger than a deck of cards will be returned to sender. NOTE: Letters and packages sent by courier or certified mail will not be accepted. 2. Keep reading our Blog! NOTE: Always leave return contact numbers and indicate the action you would like CRROBS to take regarding communication. Getting a new surfboard is really exciting. You have the chance to get to know the board, know the feel of it, the thickness and the balance points. You know how to take the drop, how much speed you'll get and how to carve on it. It's easy to get attached. So when its time to take a surf-trip, of course you want to bring along the board you love best. While once-upon-a-time, all you needed was a passport and a board bag to have an international surf adventure, airlines have started to make it more and more difficult for surfers to travel with their boards. These days, oversized baggage fees, undersized planes and travel embargoes are normal roadblocks for traveling surfers run into. Because of these things, we at Costa Rica Outward Bound don't always recommend bringing your own board on course. It often is more trouble than its worth. Plus, we have a great selection of boards from 5'4" fish to 10'6" longboards and everything in between), so if you're renting from us, you're bound to find something you'll love shredding on. If you are set on brining your own board however, here is an excerpt from a great article from www.ijustsurf.com, with up-to-date information on taxes and fees for traveling with surfboards, by airline. Varies Variable Excess Baggage Charge + $22 “Bulky Item” charge. Free As part of your two-bag limit, otherwise $80. Max. length is 6½ ft.
$50/$75 63-80 in/81-115 in. One-way per bag. $100/$150 Domestic/International. One-way per bag under 70 lbs. EMBARGO IN EFFECT No surfboards allowed on Continental flights to Latin America from June 4, 2009 through August 20, 2009. Embargo also in force during Christmas and Easter. Domestic/$300 International One-way per board. $100 One-way. Two boards max. per bag, Max height 11ft. $50/$350 $50 for the first board. $350 a piece for others. Free; Cannot exceed 80″ or 99 lb. Free as part of your two bag limit. Otherwise $53 each way. $50/ $150 international Domestic/International. One-way per bag (2 boards per bag). No size restrictions. Free, limit one per customer. Side note: it's not uncommon for surfers who prefer to surf their own board to purchase one when they arrive in Costa Rica. Its often more economical than paying round-trip airline fees, and frequently they are able to sell the boards before leaving the country, virtually eliminating all any expense. 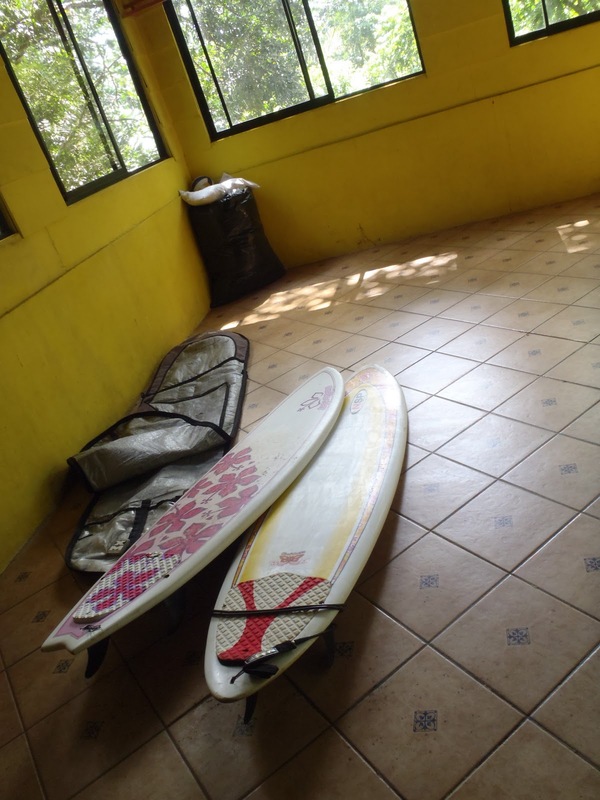 Should you chose this option, Costa Rica Outward Bound's local surf instructors can help you find and purchase a new or used board for your Costa Rica surf adventure.